This is one of those recipes that I’d made for years and sort of forgot about. I’m glad I remembered it, because it’s so darn easy. And as a bonus, my kids completely devoured it last night for dinner. So it’s definitely a winner! Oh so long ago I picked up a Nordstrom cookbook. Sounds a little weird I know, but they have a cafe and the food is actually really quite good. The book I have is more than 10 years old. It’s the Nordstrom Friends and Family Cookbook and I’ve adapted many recipes from it. It’s not a vegan book, so I’ve had to be a little creative…which I like to do. Their recipe for tortilla soup is outstanding. It calls for chicken, but I just add more vegetables instead. It’s awesome! This is for all my friends living in colder climates. A little liquid sunshine just for you. A little spice to warm you up on those chilly nights. A little comfort food to let you know that you are going to be okay. And a little reminder that Spring is just around the corner. 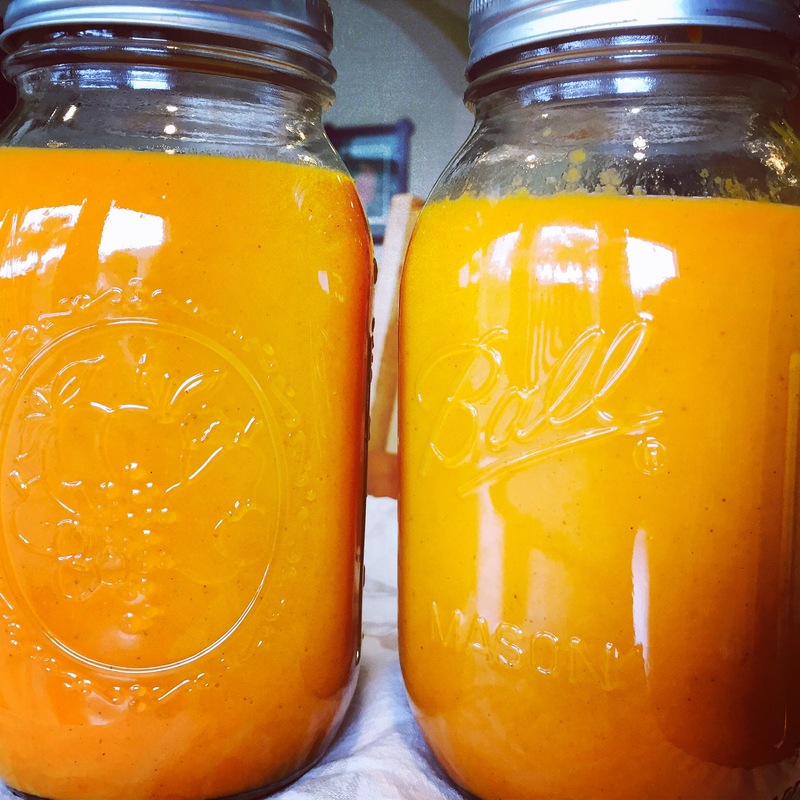 Carrots are perfect for a pureed soup. They have just the right texture, sweetness, taste and the most beautiful color. Slow roasting the carrots brings out even more depth of flavor. I love this technique, one that I borrowed from the New York Times’ Mark Bittman. Spring is here in Houston and I so hope we get to enjoy it for a little while at least. Cool mornings and warm afternoons. Azaleas blooming all over the place. Summer tends to hit us quickly, so I really want to savor this time. I’m finding myself motivated to clean out closets and (gasp) maybe even tackling a few windows. Spring cleaning just seems like the thing to do right now. I have more energy during this time, so why not put it to good use. Spring is a dynamic time of renewal, full of possibilities. A great time to start new projects and tap into your creative spirit. Spring is also a great time to transition to lighter foods. Whenever possible, I like to eat with the seasons. 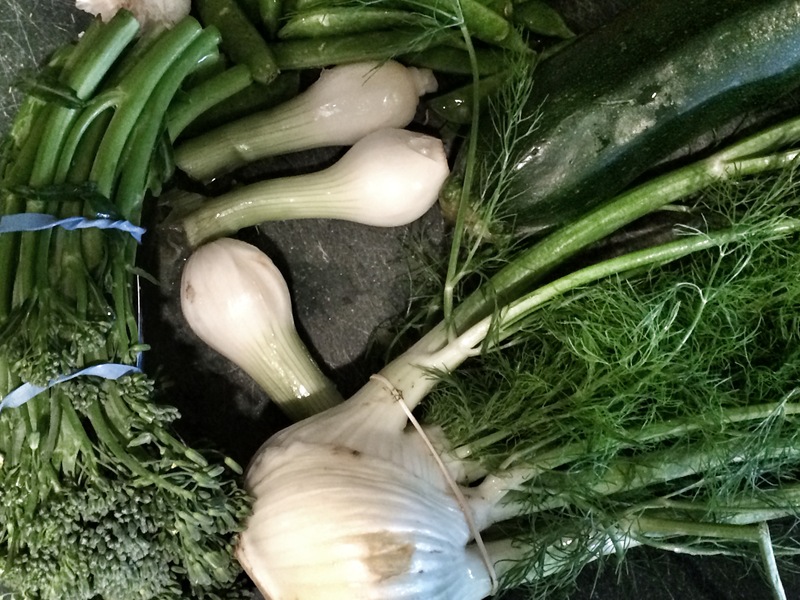 Right now for me, it’s all about green vegetables. So I threw together this yummy little soup. It’s the kind of thing you can improvise with depending on what you find at your market. With Fat Tuesday tomorrow, it seems like the perfect time to make a big old pot of my favorite gumbo: Gumbo Z’Herbs or as I like to call it Mess o’ Greens Gumbo. I adapted my recipe from the Gumbo Shop, a restaurant in New Orleans, where you can get, believe it or not, vegan gumbo. 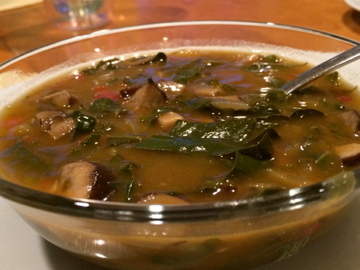 Yes, vegan gumbo in a town known for its seafood and andouille sausage and cooked gator. I even made my batch gluten free for the first time by using GF all purpose flour in my roux. And it worked with a little help from some xanthan gum. Just whisk flour, xanthan gum and olive oil together until it smells like popcorn and turns the color of peanut butter. I’ve met my new favorite squash and its name is Kabocha (Ka-bow-cha). It’s an Asian variety of winter squash. And I have no idea how it’s even possible that I am just now discovering it. 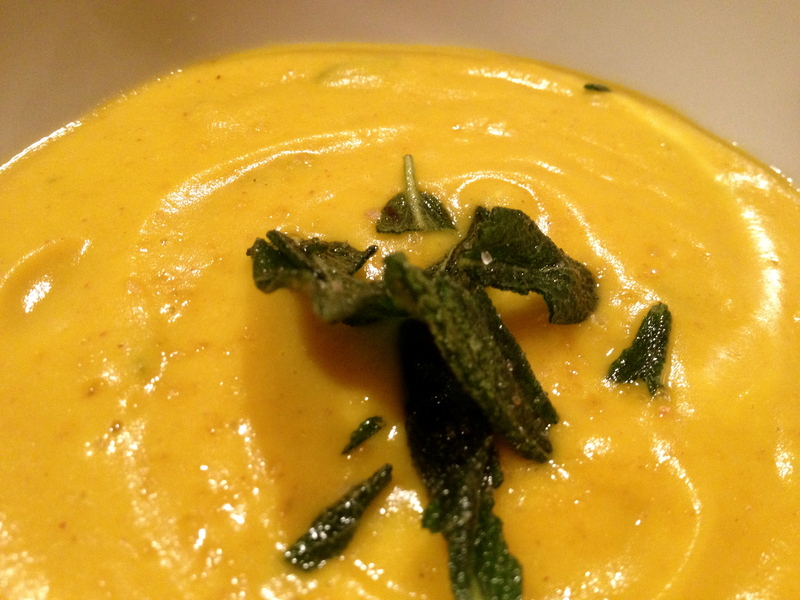 Kabocha has a natural sweetness and the perfect texture for a pureed soup. It’s so sweet that I may play around and come up with a dessert recipe for it. For this soup, I thought it would be nice to add some savory elements to balance the sweetness, so I added shallots, garlic, hazelnuts and sage. The crispy sage makes the perfect garnish. Just be careful not to brown the sage or it will taste bitter. I almost never eat black-eyed peas (except for good luck on New Year’s day) and now I am wondering why. Because they are SO flipping awesome. 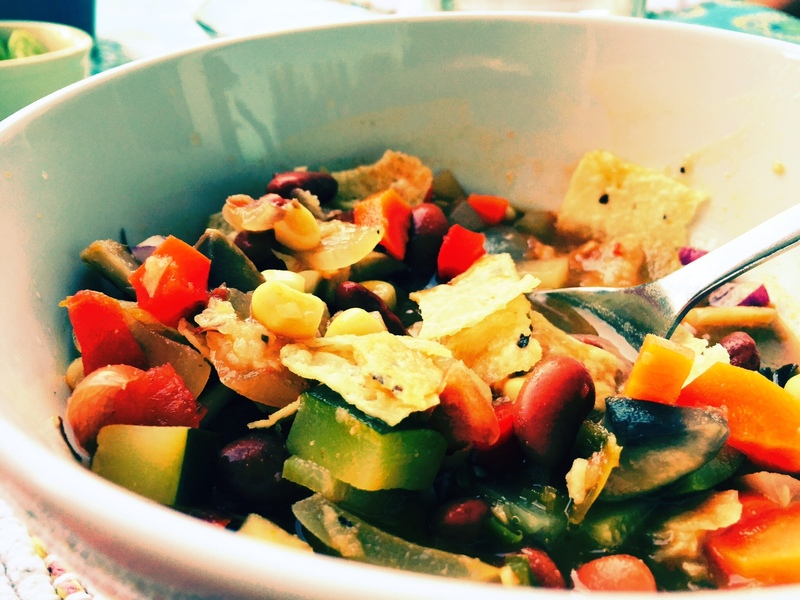 Like other beans, there are a great source of protein for a vegan or vegetarian diet. And they have a mild almost sweet flavor. 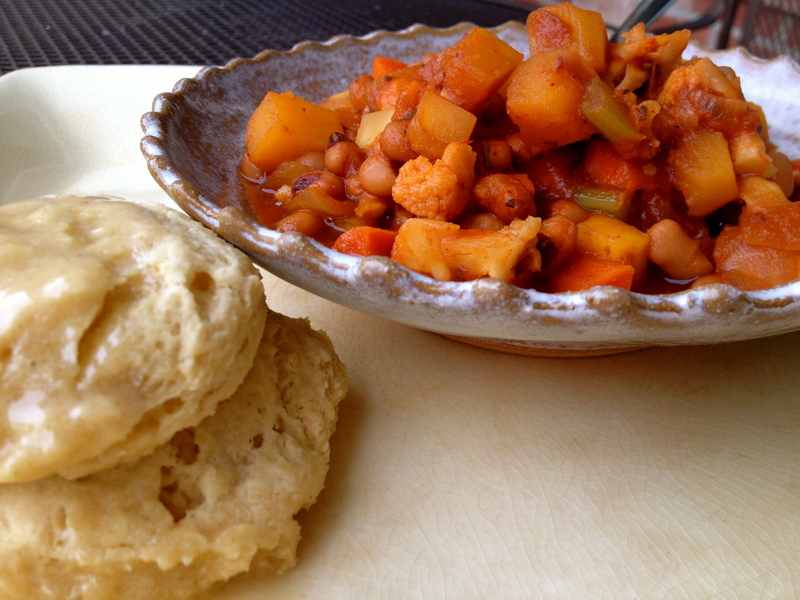 The inspiration for this recipe came from Chloe’s Kitchen, one of my all time favorite vegan cookbooks. Her recipe is called Southern Skillet Black-Eyed Peas with Quick Buttery Biscuits. It’s a winner of a recipe. I played with it a bit. Changed some of the veggies and spices. Added butternut squash, carrots and turnips. The result is the perfect fall stew with a little twist. The minute I walked into Whole Foods and saw this amazing display of the most beautiful heirloom tomatoes you have ever seen; I knew then and there exactly what I wanted to do. My mom (who is visiting me right now – yay!) was telling me about her friend Joanie’s gazpacho and how delicious it was. The best she’s ever had. 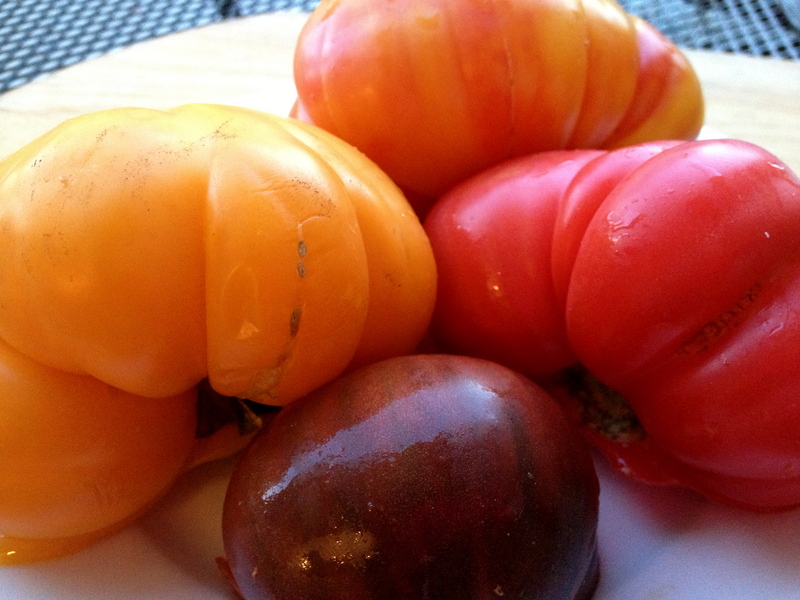 Bingo…Miss Joanie’s gazpacho with heirloom tomatoes. YES!!! Of course, I need to put my little spin on any recipe that crosses my path, so I made a little cilantro pesto with almonds to top off the chilled soup. It works. For sure.